The Palace range is a timeless classic, designed for the future. Its softly shaped design oozes luxury and sophistication. 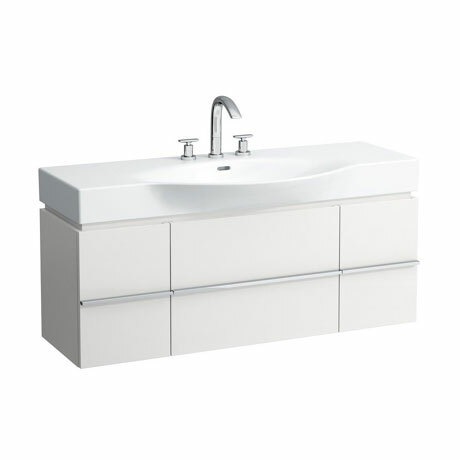 This stylish 1200mm Basin and Vanity Unit with 2 Drawers and 2 Doors will perfectly fit into any contemporary bathroom, it features an integrated handle on the top of each drawer and an aluminium handle bar in the middle. Inside the unit are 2 adjustable glass shelves for practical storage. A 1 drawer 2 door option is also available. All Laufen sanitaryware is guaranteed for 5 years and furniture 2 years.